Origin: Southern and Central Europe: stone walls, cracks. 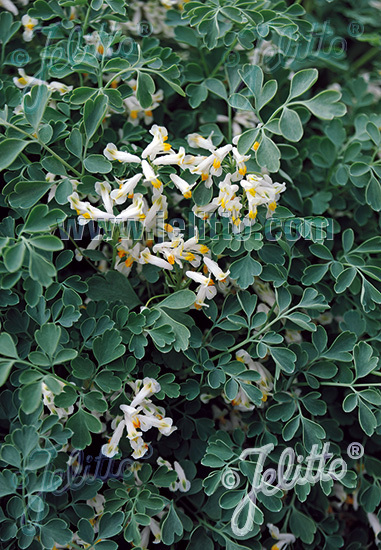 Special Features: Creamy white Fumewort has a firm growth, strong leaves and a good stability. The racemose inflorescences are embedded in the bluish-green, fern-like foliage until the onset of winter. Excellent for dry stone walls and cracks. Aromatic scent. Attractive for butterflies and other pollinators. Drought tolerant/ for xeriscaping/ water-wise design. Suitable for natural landscaping. Moderate self-sowing at suitable locations. 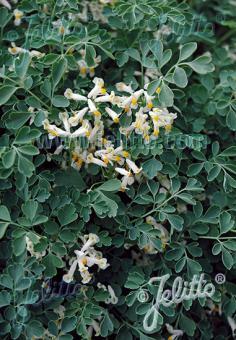 Foliage: Bluish green, feathery, fern like, 3-parted, lobed, wintergreen. (19) To stop the germination inhibition give seeds a warm compost (about +22°C) [about 72°F] with constant humidity for at least 6 weeks. Then keep cold (–4 to +4°C) [25 to 39°F] for 6–8 weeks. Usually, the germination starts at +4°C [39°F]. Raise temperatures gradually up to +10°C [50°F] until germination is completed. If the warm or cold period was not long enough the seeds will not germinate until the following year. They will then need another warm period (summer) and a cold period (winter). Well-known examples: Cimicifuga and Helleborus.